Tired of those preworkout drinks that are full of chemicals and unknown ingredients? Looking for a natural alternative? Check out Beet Performer. It contains 3 simple ingredients and is packed with nitrates that deliver oxygen to your muscles. Perfect for training. Performance doesn’t start with training, it starts with your fuel. 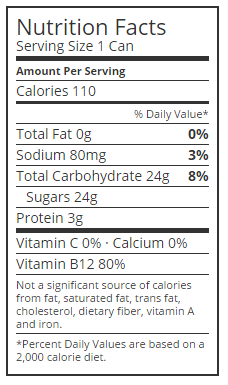 To train your best, you should only put the best ingredients in your body – like 100% beet juice. 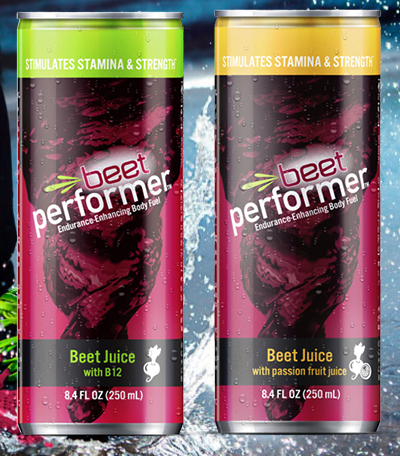 Whether you’re trying to beat your personal record or smoke the competition, do it in a pure way with Beet Performer. Research shows that nitrates in beet juice can increase blood flow and deliver oxygen to your muscles right when they need them and may enhance your cardio session. It tastes sweet & goes down smooth just like a fruit juice. Looking for the health benefits of a yummy natural beet but dont want to deal with the time consuming task of peeling and steaming them. Beet Performer packs all the nutritional benefits of beets and is vegan and gluten free in an 8fl oz. 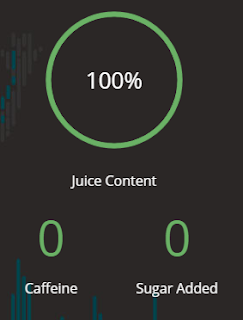 can of 100% natural juice with only three impressive ingredients. Beets are naturally high in nitrates, which act like couriers to quickly deliver oxygen to your muscles. Beets also aid in cardiovascular wellness with their heart-healthy vitamins, minerals and antioxidants. Beet Performer comes in original and also in Passion Fruit. Both are sweet and natural tasting and go down easy. Great for a preworkout, great for a morning pick me up. What an easy way to get in more veggies into you diet in a quick & healthy drink. Conveniently packaged in an 8 oz can you can take one on the go. Fermented foods are a great addition to your diet and the fermented juice in Beet Performer fit that bill. Independent studies have shown that beet juice increases athletic performance, improves stamina and strength, and also allows the body to recuperate better from physical activity by increasing the amount of oxygen and blood flow to the muscles, heart, and brain. 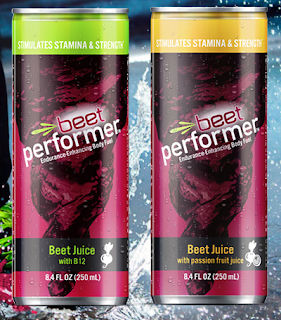 Making Beet Performer great for pre or post workout recovery!